Japanese Foreign Affairs Parliamentary Committee leader Shinako Tsuchiya (left), with Foreign Affairs Minister Ratu Inoke Kubuabola. Foreign Affairs Minister Ratu Inoke Kubuabola believes Fiji and Japan have the potential to further strengthen their bilateral relations this year. 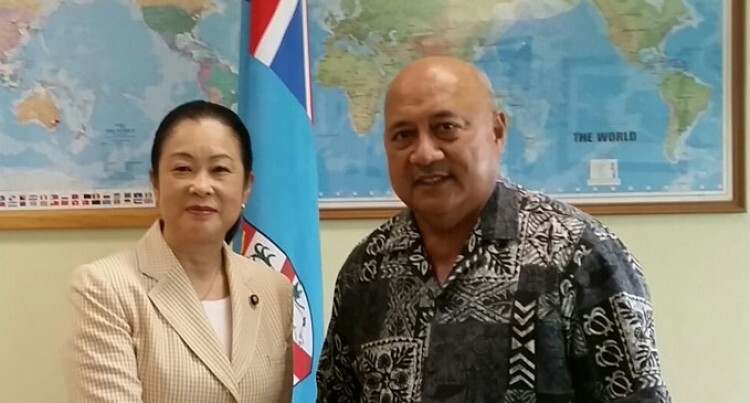 Ratu Inoke, when meeting Japanese Foreign Affairs Parliamentary Committee leader Shinako Tsuchiya who paid him a courtesy call in Suva yesterday, said Fiji was looking forward to the good opportunities the two countries would be sharing. “I am thankful to the Japanese government for all the development co-operation projects that have been implemented through JICA and your hardworking staff of the Japanese Embassy who have developed a close working relationship with our ministry staff,” he said. He informed the committee that the scheduled visit of another Japanese delegation early next month to participate in the Japan- Fiji Economic Co-operation Policy Consultation would be a positive indication of the growing mutual interest between the two countries’ development policies. Ratu Inoke congratulated Japan for the elections victory by a super majority of the Abe Coalition late last year. He thanked them for their support during the elections in Fiji last September. He briefed the committee led by Ms Tsuchiya of the post election developments in Fiji. He informed Ms Tsuchiya that Fiji’s current Parliament make up had the highest number of female representatives to date. “We have a Parliament where most of our members are relatively new to the experience,” he said. He extended the Fijian Government’s request to Japan to explore that initiative by inviting a Parliamentary team from Fiji over. Ms Tsuchiya would be meeting with Speaker, Jiko Luveni and Minister for Women, Rosy Akbar.